The rapid development of self-driving, autonomous vehicle technology is leading the way to a transportation revolution with three major components: self-driving cars, shared mobility, and electrification. 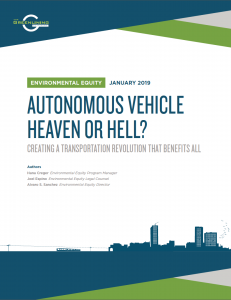 While much has been written about how the coming autonomous vehicle revolution may change transportation for the better, this report represents the first in-depth analysis of a wide range of mobility, health, and economic implications of these three interconnected revolutions for marginalized groups like people of color, the poor, the elderly, and those with disabilities. Greenlining’s analysis finds that optimistic scenarios for this transportation revolution – including reduced traffic, cleaner air and less space wasted on parking – won’t come true without action by government to ensure that implementation of these technologies recognizes their broad impacts, especially the needs of marginalized groups. A transportation revolution that truly benefits all will need to center on FAVES: fleets of autonomous vehicles that are electric and shared, with rules designed to disincentivize personal autonomous vehicles and to promote affordability and access, along with fair labor practices in this new industry. Without such intervention, the autonomous vehicle revolution could lead us to transportation hell, with a growing mobility divide between haves and have-nots.